Each thing we see hides another, we always want to see what is being hidden by what we see. There is an interest in what is hidden and in what the visible does not show us. This interest can take the form of a fairly intense feeling, a kind of conflict, one might say, between the visible that is hidden and the visible that is present. On offer at the auction for Reveley’s estate were eighteen volumes of the Encyclopedia Britannica; a violin and a violoncello; a pair of pistols and a sword; three pieces of Indian Ink in a jappanned box; a container holding a “quantity of curious Turkish pipe heads”; and dozens of sketches of “Views” from Reveley’s 1785 journey to the Levant. Among these landscapes and studies, all in pen and ink with watercolor, one is quite different from the others. This piece, listed in the auction catalogue as “View of a Fragment,” is a sketch of a massive statue of the goddess Ceres, or Demeter, as the Greeks called her. The statue is set beside the ruined temple of Eleusis—an ancient town on Greece’s Thriasian plain. In the sketch, the head and shoulders of a faceless woman—her features worn by weather and time—rear up from a grassy knoll. The rest of the statue seems to be buried beneath the ground. The woman’s right shoulder is missing. Above her left shoulder hangs the knot of a robe. An ornate basket decorated with agricultural symbols sits on her head, part of which is also crumbling. The sun burns down on the statue and the basket casts a shadow over the upper part of the disappearing face. The figure is a caryatid—an architectural female column—but in Reveley’s sketch it looks like an ancient, female Magritte. A piece like Magritte’s Memory places an architectural fragment within a scene at once strange and everyday; The Son of Man and The Difficult Passage, meanwhile, play at portraiture while refusing the pleasures of the face. Like the Magritte, the mood of Reveley’s sketch is at once oneiric and ordinary. Reveley said nothing about why he chose to sketch that particular statue, which likely represented a priestess of the cult of Ceres, rather than the goddess herself. But he was hardly the first or last to be drawn to it: the caryatid would prick aesthetic pleasure and imperial desire for later British visitors to these ancient grounds. Reveley’s reproduction survived, but the statue that he sketched was itself an imitation of a Greek tradition of caryatids—a tradition that, in turn, imitated artistic forerunners even more ancient, traditions to which we no longer have access. Such imitations had become ruins long before being reproduced in Reveley’s notebook: his sketch, then, was a copy many times removed. Each thing we see hides another: these copies simultaneously point at and muddy their origin. To trace their various paths through history is to accumulate a catalogue of different iterations of the caryatid—in a way, different sketches of the form. Like the auction catalogue for Reveley’s estate, the caryatid is a collector’s delight. The caryatids were an initiation to the initiation represented in the sanctuary at Eleusis. But, like the mysteries themselves, they also glanced back to more ancient cultural forms. By the first century B.C.E., Rome was comfortably triumphant over Greece in politics, but still writhed with cultural insecurity, seizing and emulating certain elements of Greek culture while attempting to defuse others. Caryatids were among these appropriations: by the first century copies were proliferating, in the Forum of Augustus, in the Pantheon of Agrippa, as well as at the newly built sanctuary at Eleusis. Or, as André Breton writes, “The marvelous is not the same in every period of history.” At some moments made meaningful as icons of trauma and enslavement, at others as noble bearers of divinity, the caryatid would become in different ways more and less visible by the time Willey Reveley encountered his fragment. The crumbled-away face of the caryatid no longer bore witness to the lootings of its history. Instead, it had come to bear other meanings. For eighteenth-century English travelers, statues like this one were vestiges of an old empire that could also play a role in a new one, as specimens of newly acquired imperial knowledge. 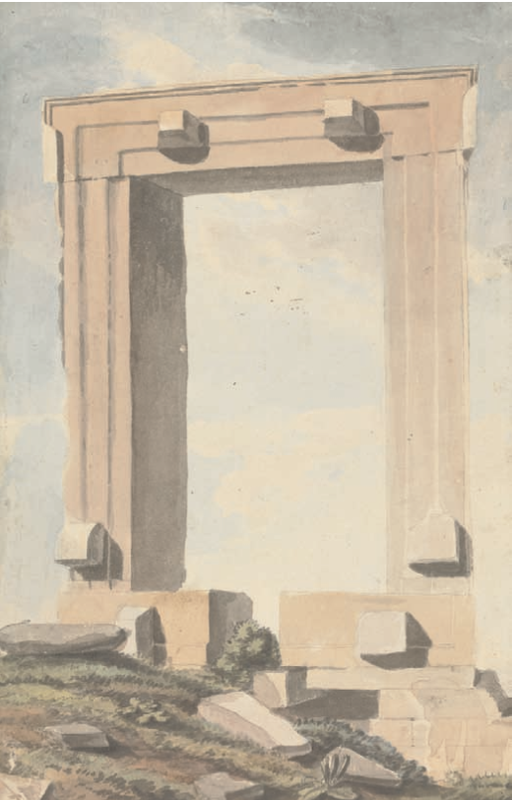 When Willey Reveley found himself outside Athens, in 1785, his version of the Grand Tour, that de rigueur eighteenth-century rite of passage, the caryatid had again become part of the infrastructure of empire. Reveley had been a student in London in the late 1770s, then an assistant architect at the newly built Somerset House. By 1784 he was living in Rome and looking for a job, until a colleague put him in touch with the antiquarian Sir Worsley, fresh from an acrimonious scandal of a divorce. Worsley hired Reveley as his draughtsman for his upcoming journey to the Levant, and the pair left Britain in February 1785 for a voyage that would take them from Italy to Greece and eventually to Egypt and Constantinople. On the way, near Brindisi, Reveley paused to draw the castle of Otranto, made famous by Horace Walpole in his 1764 novel of that name. (The Castle of Otranto begins with a massive plumed helmet, perhaps a Gothic version of the Roman ruin, falling and crushing a character—an extravagant Gothic sublime). The two continued to the Peloponnese, arriving in May 1785 and stopping early on at Eleusis before traveling to Corinth, Argos, and Sparta: they returned to Eleusis in June. Eleusis turned out to be a privileged spot for Reveley’s attempt to find the picturesque, to encounter scenes and views awaiting their discovery, regard, and recording. Reveley reserved a quite different tone for the caryatid, abandoning the sardonic for the forthright: “Her face is beat off; her hair is tied with a ribband behind & on her head is a circular Vessel like a basket elegantly carved with wheat ears & other ornaments.” This is all that he records of his personal aesthetic encounter. But there is a hint that this encounter, or at least this part of his journey, stayed with him longer than other segments of the trip. Reveley lingered in Athens further into the summer; he finally left in July, “with infinite regret.” Soon after that his journal ends. By early 1786, Reveley had had one final quarrel with Worsley and was making his way back to Rome, where he would arrive, alone, in the fall. Reveley’s writings never mention that his caryatid had a twin, one with her face still intact. Perhaps he never saw it; perhaps the faceless statue spoke to him more. In 1801, another Englishman, treading the same well-worn Levantine tour, would be struck by the same faceless statue. Edward Daniel Clarke would remove the caryatid from the Eleusinian plain and eventually, back in England, donate it to the University of Cambridge, which rewarded him for the theft by bestowing on him an honorary doctorate. The Cambridge version can be found in the city’s Fitzwilliam Museum, while the twin, this one with face intact, remains in the Eleusis Museum. Writing almost thirty years before Reveley left for the Levant, Edmund Burke, considering the nature of aesthetic experience, tried to argue that the sublime was not just different from the beautiful but categorically, even physiologically, opposed to it. The latter was a kind of pleasure; the former, a kind of pain. The sublime, Burke wrote, prompts astonishment: “that state of the soul, in which all its motions are suspended, with some degree of horror.” Sublime landscapes, according to the taxonomy that Romantic painters would make of such categories, are associated with vastness, desolation, danger: there is something in them, or in our response to them (or both--in this Burke was never quite clear) that is impossible to master or control or, intellectually at least, to grasp. Reveley’s caryatid sketch relies on none of these well-trodden tropes. Detailed and diminutive, rather than grand and all-encompassing—drawn in ink and watercolor rather than painted in oil on canvas—the sketch fits far more comfortably into the category of the picturesque. But in the nearly smooth surface of the faceless head, and in Reveley’s short, circumspect response to the statue as he saw it—so different from the jaunty tone he tends to take elsewhere—there seems to emerge a kind of miniature sublime. Throw any meaning at the statue you want, the sketch seems to say, it will refuse your impositions. It will display and cloak its own history. The very notion of the sketch—hasty, tentative, unfinished, deferring interpretive closure—might share a family resemblance with the interpretive impasse of the sublime. Reveley went looking for the picturesque; perhaps he found in its stead, and in his sketch, the sublime. The rest of Reveley’s life reads, more prosaically, as a series of sketches, of unfinished paths. He might have settled into the serene folds of eighteenth-century sociability: Horace Walpole, impressed by the Otranto sketch, was willing to give Reveley a tour of his famous estate, Strawberry Hill. Yet the rest of his life, as far as records show, bears witness to a “promising career, marred by a somewhat splenetic temper.” After returning from his trip, his politics became vaguely radical; he befriended William Godwin, exchanged letters with Mary Shelley. But he remained a dreamer, a schemer. While independence movements were raging in Paris and in Port-au-Prince, Reveley’s mind was elsewhere. He thought he might redesign the entire layout of public baths and pump rooms in the city of Bath; he thought he might resolve the perennial problems of the London Docks, plagued by congestion, theft, and traffic jams. He sketched out these plans. He also sketched out a proposal for adding a set of wet-docks to the shore of the Thames, presenting it to Parliament and suggesting that the Isle of Dogs be put to that purpose. The plan died in committee. When Reveley died, among his possession were found dozens of plans and projects for churches and bridges; for a hothouse, a villa, a musical theater. His private collection, including many of the sketches that were part of the Christie’s auction, was sold off in parts and fragments, most of it to private buyers. Paul Mellon, the founder of the Yale Center for British Art bought the caryatid sketch and a few others in 1960 from C.A. Stonehill, a New Haven dealer, who in turn had bought them in London. Like the statue, the sketch trundled across seas and empires. And from Caryae to Athens and Eleusis to Cambridge, from marble to watercolor to the material memories of texts, the caryatid outlasts its makers. Faceless if not defaced, a Mona Lisa without a smile, it hides, in all its versions, in plain sight: its history remaining, like anyone’s, a more or less open secret. Victoria Baena joined Yale’s Department of Comparative Literature in the fall of 2015. She focuses on literature of the long nineteenth century, mostly in French and English but also in Spanish, German, and Portuguese. She is particularly invested in developing connections between literary and historical analysis.